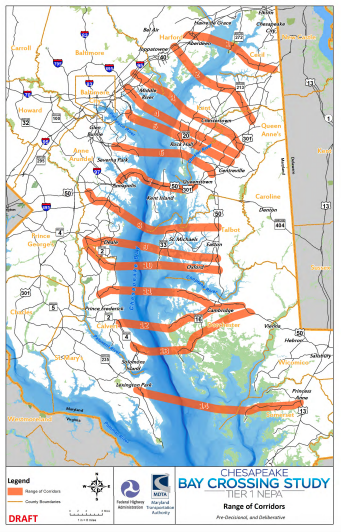 The Maryland Transportation Authority and Federal Highway Administration have released a draft of 14 possible options for a new Chesapeake Bay crossing. Find full maps here. The draft options for the new Chesapeake Bay Crossing. The purpose of the Tier 1 NEPA Study is to consider corridors for providing additional capacity and access across the Chesapeake Bay in order to improve mobility, travel reliability, and safety at the existing Bay Bridge. The Tier 1 NEPA Study is evaluating potential new corridor alternatives that will include assessment of existing and potentially expanded transportation infrastructure needed to support additional capacity, improve travel times, and accommodate maintenance activities, while considering financial viability and environmental responsibility. Stay tuned for upcoming spring open house dates and locations. Click here to submit comments. In 2016, Maryland Governor Larry Hogan announced that the Maryland Transportation Authority (MDTA) would begin a study to identify the location of a new Chesapeake Bay crossing with consensus from Eastern Shore Counties, since state law requires a majority of them to agree. In November 2017, the MDTA hosted an online public meeting regarding the project. The MDTA is affiliated with but independent from state government, so it does not receive funding from the General Fund or the Transportation Trust Fund, nor does it receive any tax dollars. The $5 million study will explore potential funding options and is expected to continue into 2020. The Chesapeake Bay Crossing Study: Tier 1 NEPA (Bay Crossing Study) is a National Environmental Policy Act (NEPA) study that will result in the identification of a preferred corridor alternative to address congestion at the Chesapeake Bay Bridge and evaluation of its financial feasibility. The Bay Crossing Study will evaluate current and future traffic demand across the Chesapeake Bay. The study area is a broad geographic area that includes the entire length of the Chesapeake Bay in Maryland, spanning approximately 100 miles from the northern end near Havre de Grace to the southern border with Virginia between St. Mary’s and Somerset Counties. Identify the corridor of a new crossing.